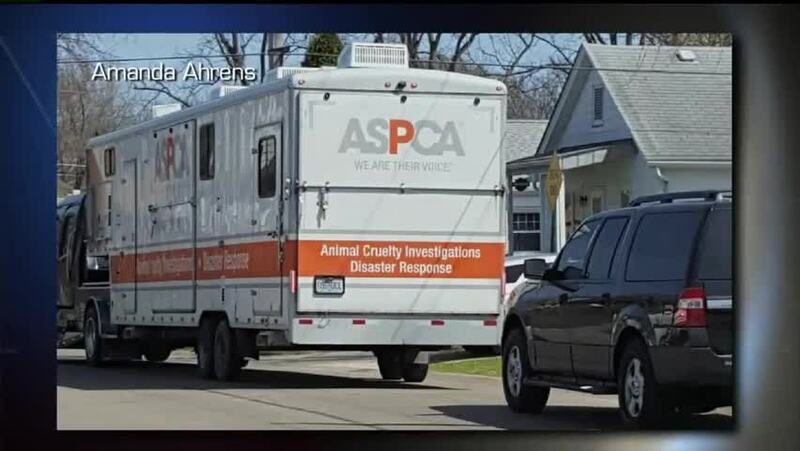 ROCK ISLAND, Illinois (WQAD) — Ten search warrants were executed in Rock Island and one in Davenport on Thursday, April 14, in connection to a dog fighting ring. 64 pit bulls along with narcotics and a gun were seized during the effort. The American Society for the Prevention of Cruelty to Animals (ASPCA) has been called in to help transport to the dogs to a temporary shelter until custody is determined. Arrested were 41-year-old Ryan Hickman and 34-year-old Willie Jackson, both of Rock Island. Hickman is charged with possession with intent to deliver a controlled substance. Jackson is charged with unlawful possession of cannabis. It wasn't immediately known if the two have legal representation, reports the Associated Press. State's Attorney John McGehee said a myriad of animal abuse charges, felony and misdemeanor offenses are possible under Illinois law. "After search warrants were served Thursday morning by the FBI, responders discovered dogs tethered on heavy chains and training devices consistent with dog fighting," states the release from the ASPCA. The dogs are receiving attention from veterinarians, behaviorists and responders. "The level of brutality we continue to see in organized dog fighting rings is profoundly troubling," said Tim Rickey, vice president of ASPCA Field Investigations and Response. "We're relieved these animals have finally been removed from this cycle of violence. Many people will be surprised to learn that dog fighting is happening in their community. It's an underground activity that goes mostly unnoticed by the public, but it happens all across the country." The investigation into the dog fighting ring began a year ago after information was collected by members of the Rock Island Police Department, FBI's Quad Cities Federal Gang Task Force. At least 13 agencies have participated in this ongoing investigation and more information will be available in the future. Anyone with information related to illegal dog fighting, or other crimes, may contact the Rock Island Police Department at 309-732-2677 or Crime Stoppers at 309-762-9500.